Common Enrollment is being brought to Oakland by the same consultant that led the process in Denver where charter school advocates *intentionally and strategically* kept parents, teachers, community members and even School Board Members in the dark about their true goal: not improved enrollment, but Common Enrollment. Sound familiar? Here is a quote from a presentation by (Walton Foundation-funded) C.R.P.E. about the strategy used in other cities, which is now being replicated in Oakland. OAKLAND — To some, it’s a streamlined system that allows families to more easily navigate a daunting array of school applications to find the best fit for their child. To others, it’s another Silicon Valley-backed reform tool that would undermine a struggling public school system by promoting charter schools. A novel proposal by school district leaders to overhaul the school enrollment process would make Oakland the testing ground in the state for a universal enrollment system that allows parents to fill out a single application for their top choices for schools, both district-run and charter. Charter schools have been school options for Oakland families for decades, despite the fact that some residents in the city’s highly segregated neighborhoods with high poverty levels may not realize it, said Superintendent Antwan Wilson. And it’s been difficult for the city’s most disadvantaged families to learn what all their options are, he said. The system has already been adopted, some say with mixed results, in Denver, New Orleans, Washington, D.C., and Newark, New Jersey. But like in Oakland, proposals for Boston and Philadelphia are meeting resistance because charters compete with public school districts for the same limited education dollars. Opponents fear that an exodus of students to charter schools would decimate the public schools. They say that charter enrollment policies allow them to “cherry pick” students and deny entry to those who will not further their academic goals. That could be a concern. Some districts that have adopted common enrollment did not require charter schools to align their recruitment and retention policies with their respective public schools, and others allowed charters to opt out of the new program. In response to critics, Wilson is pushing for the signing of a district-charter school compact, called an “Oakland Public Schools Equity Pledge,” which would help ensure an equitable playing field for all Oakland public schools.”It’s all grounded in the principles of equity and ensuring that our students get what they need to be successful,” said Wilson, who came from the Denver school district but did not spearhead the switch to common enrollment there. Oakland’s current enrollment system, which district officials say is inefficient and outdated, allows families to fill out a common application to enroll at any of its public schools, ranking their top choices. But the charter schools have separate applications. The district spends about $1.8 million annually on its enrollment system, and the new common enrollment system would cost an additional $1.4 million to start up. Philanthropic organizations would likely foot that startup bill, but only if charter schools were included, because that’s the best way to ensure an equitable system for students, said Gloria Lee, executive director of Educate 78, a pro-charter school group that is linked with Silicon Valley-backed NewSchools Venture Fund and the Bill and Melinda Gates Foundation and Walton Family Foundation. The group made a $300,000 investment to fund the initial outreach and development of the system, which sparked more angst among opponents. “Why is the district allowing a private entity with their own agenda to market this?” asked Kiera Swan, who has two kids in Oakland public schools. The so-called common enrollment system would allow parents to use their smartphones or visit enrollment centers to do easy side-by-side online comparisons of both charter and district-run schools throughout the city and apply for them in a common application, regardless of school type. A computer algorithm would generate a single match for students, streamlining the process for families, who currently have to navigate through a hodgepodge of different deadlines and requirements for charter schools. The exact mechanics and algorithm will likely be shaped based on additional community input and school board guidance, said OUSD spokesman Isaac Kos-Read. Kim Davis, co-founder of OUSD Parents United, warned that results are mixed in districts that have adopted the system. In Washington, D.C., the feedback from families and schools has been “overwhelmingly positive,” even though 5 percent of charters have not opted in, said Shayne Wells, a special assistant to D.C.’s deputy mayor for education. He said the percentage of students in charter and public schools has remained relatively unchanged at 44 percent at charters and 56 percent at public schools. In Denver, which has had the system since 2012, many parents are satisfied with the system, with about three in four students matched to their first-choice schools, said Van Schoales, Chief Executive Officer of A+ Denver, a community-based education reform group that supports charters. But he admitted that parents from low-income areas remain frustrated by their access to the best schools because they often require traveling across the city and such spaces are limited. And in Newark, universal enrollment didn’t cause a migration to charter schools from public schools; it was already happening, said author Dale Russakoff. Her book “The Prize: Who’s in Charge of America’s Schools?” chronicled the impact of Mark Zuckerberg’s $100 million donation to reform the Newark’s public school system. The exodus, particularly from the highest-poverty ward of the city, where student performance is the lowest, led to hundreds of teacher layoffs and one-third of district schools being closed, consolidated, repurposed, relocated, restaffed or turned over to charters the first year of universal enrollment, she said. “The bottom line is that if there had been more charter slots available, there would’ve been a larger exodus from the traditional public schools,” she said. All the more reason that Oakland shouldn’t be encouraging an enrollment system that would pave the way for many students to apply to schools that aren’t district-run, critics say. 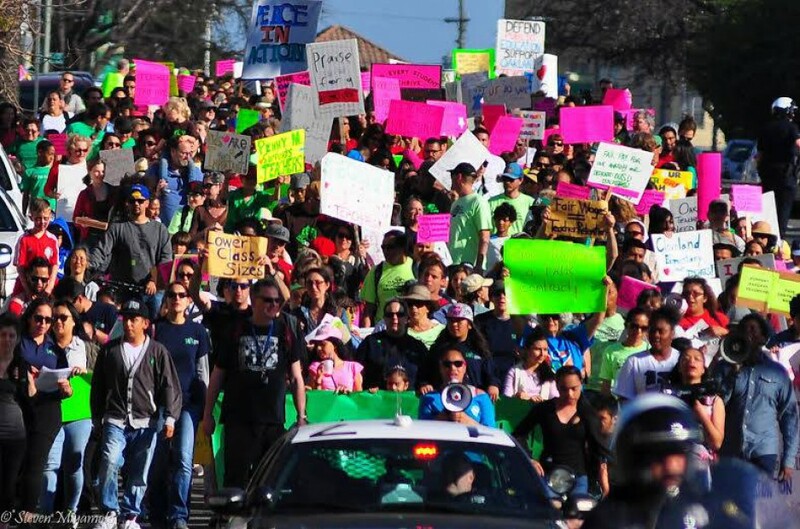 Community unrest surrounding the proposal has delayed a board vote on the measure, which was planned for January, at least until June. Even still, the district on Monday is rolling out a test version of a school finder tool (ousd.org/schoolfinder) that could be used with common enrollment. It will allow users to find nearby schools, both district-run and charter, and review each one’s academic performance and enrollment information. Board President James Harris said that he believed the charter compact would need to be to signed first, before common enrollment can be considered. School board member Shanthi Gonzales agreed, adding that too many questions on the proposal’s impact on district schools remain unanswered. Lee, of Educate 78, said it was unfortunate that the impression was that the pro-charter groups’ advocacy was somehow done secretly.